Bydgoszcz appears for the first time in historical records on June 28, 1238. The Annal of the Chapter of Gniezno features the Bydgoszcz Castellan called Sulisław. 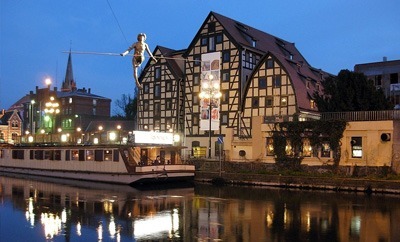 Although the name “Bydgoszcz” is not mentioned, we know that the quoted Budegac is the city on the River Brda. Bydgoszcz, as a city protecting the crossing over the river, was founded most likely in the early 11th century in the area of the present Saint Andrew Bobola Church. The wartime had a negative impact on the architecture of the place, but the Old Town, located off the coast of Brdy, was perfectly preserved. The Church of the Assumption of the Virgin in Bydgoszcz was built in the late 16th and early 17th centuries. For many years of its history, beautiful interior decorations were hopelessly lost, but there was a Gothic chandelier, a wooden ceiling, an altar and, of course, art forging of that time. One of the gorgeous sights is the quarter, called Bydgoszcz Venice, which today is located on the river and permeated with canals. The place attracts by its resemblance to the Italian landmark and the buildings over which the eminent architects worked. 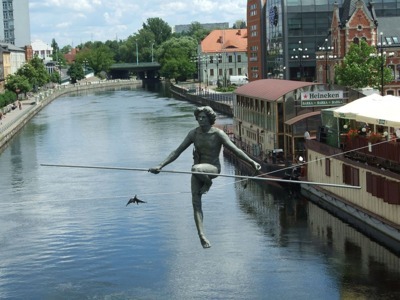 As for the culture of the city, Bydgoszcz is considered one of the main European centers of jazz music. Renting a bus with a capacity for 65 passengers is a great opportunity to spend an unforgettable time in Bydgoszcz. Every tourist can have an amazing time, using the service of bus rentals for various purposes. 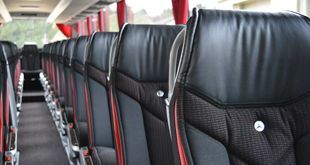 By using the 8rental bus hire with a driver service, each client doesn’t have to worry about his time, comfort and safety. Send us a quote and fill out all your requirements and you will receive a confirmation in a minute if all details are clear for us! Our customer service staff are accessible, knowledgeable and courteous. They developed excellent listening skills and a willingness to compromise to reach a resolution. You will find them always speaking clearly and slowly while maintaining a calm demeanor, even if the customer doesn't know exactly what he is looking for. We focus on our clients' preferences and demands. We approach every request individually as we want our customers to know that we care about each of them in part and we would do anything possible to fulfill their expectations. 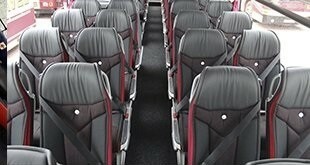 The buses are very comfortable and spacious, inside each of the customers will be able to find everything that he needs for convenience and comfort. These modern buses are very safe and are regularly checked in car repair shops, therefore the guarantee of the safety of passengers during the tour is guaranteed. The company offers not only high-quality and fast buses but also well as extensive experience in passengers' transportation. They are highly qualified drivers who have a serious approach to work, our drivers are very serious, punctual, conscientious and reliable people. They also have the ability to speak at least one of the international languages, so that the communication process will go smoothly and without stress. We are sure that you have already stopped your searches for a reliable bus rental with a driver company and you will send us your request in no time!